A futurist once told me that Facebook and Twitter will be gone in 20 years. As I wrote previously, Johannes Koponen cited "technological advances, pressures to keep growing and monetize, generational differences" as forcing the eventual demise of Facebook and Twitter. They're certainly not gone now. They're vibrant and larger than ever it seems, everywhere you go. We're bombarded by advertisements in the media for these two giant social networks - follow us here, like us there. The Super Bowl is next Sunday, and of course there are already social media campaigns for it underway. I was talking to a friend at work the other day about the lack of big social media challengers. There is no shortage of social networks and it seems new ones are being spotlighted all the time. But is any one site becoming a part of the daily life of millions of Americans like Facebook and Twitter? The social media space has matured enough that there's already a social media graveyard (remember these sites?). Competition is intense. How do you build a behemoth? What will be the next big thing? It's my belief that the biggest reason Facebook and Twitter have such a commanding lead is this: We only have so many hours in the day. Time spent on social networks is still a fraction of our time awake; other hours we're sleeping, which forces us to turn off social media. We're creatures of habit so we choose to spend our limited time with sites we're familiar with and so many others are using. Every time a formidable challenger appears to pop up, it can never quite keep the momentum going quickly enough to scale in the context of Facebook and Twitter. 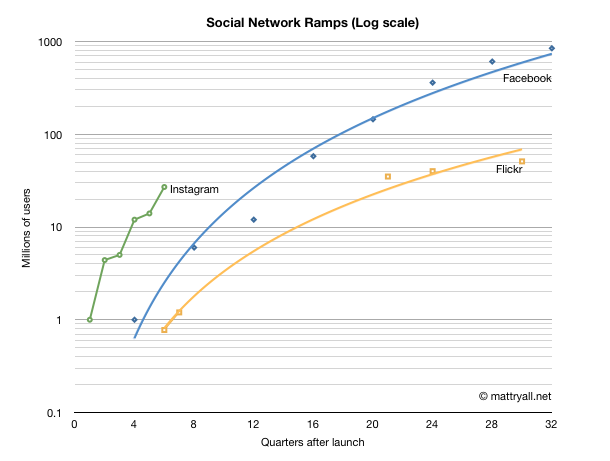 Instagram's rapid growth (see this chart) made it seem poised to be the next giant social network, especially with its mobile focus, then Facebook acquired it. Pinterest grew significantly in 2012 and yet it still doesn't put up Facebook and Twitter numbers. Similarly, Tumblr and LinkedIn are big, but not quite Facebook and Twitter big. A list of the 15 most popular social networking sites in January 2013, per Alexa, have Facebook and Twitter at the top. That said, Google+ is trumpeting a new study which says it's the now the second biggest social network, per active users, only behind Facebook. Given Google's reach and the ability for it to prominently include Google+ in its search engine, this isn't surprising. Google+ will probably continue to have the best chance to compete with Twitter and Facebook of anything out there, at least in the short term. As Google+ has been called a ghost town by some, Google VP Vic Gundotra joked in light of the new study, "That is a lot of ghosts :-)"
The fact is Google+ does seem to be gaining momentum and 2013 could be the year of Google+. It does boast a large number of active users, but are we spending a ton of our social networking time there right now? It doesn't seem that way yet. Others don't have the scale and resources of Google to put up a serious Facebook or Twitter challenger. They reign at the top of the social networking world and it seems it could be that way for some time at least. But as we know from the history of the Internet, big sites come and go. Habits change. New generations prefer new things (it isn't "cool" to be on a site Mom or Dad is on all the time). Anything is possible. And 20 years is a long time. Especially 20 years on the Internet.